Posted: Monday, March 5, 2012 12:00 am | Updated: 1:04 am, Mon Mar 5, 2012. POST FALLS – Surrounded by cold, dark and mostly empty industrial warehouses, there is a light. It’s the light from a doorway leading into a warm, bright warehouse that is full of people. On this recent night, around 50 people have checked into Ignite Hope for the night. It’s the only warming shelter in the greater Coeur d’Alene/Post Falls area that is open every night during the winter, to anyone, in any condition. A variety of mothers, fathers, children, veterans, and even a man who is walking across America are scattered among sleeping bags, clothes and boxes. There are musicians, artists and a former meteorologist for the U.S. Air Force. Near the entrance, teenagers and college students gather, gesticulating their stories and laughing. A white lab named River eats scraps of food that have fallen from a card table covered in casseroles. Two volunteers greet people checking in for the night while guitar music wafts in between friendly conversation. Ignite Hope opened in November 2011. As a grassroots shelter run by everyday people, Ignite Hope provides shelter, meals and comfort to the homeless. Thanks to the generosity of a private donor from Real Life Ministries, the building was made available. Volunteers from Real Life and other churches prepare meals daily and offer Bible studies and prayer. Ignite Hope was formed by the hands of a few individuals determined to make their beliefs into reality. What sets Ignite Hope apart is its vision of hope for humanity. People like spending time at Ignite Hope. The impact of Ignite Hope on the community is already yielding results. Patrick once lived a life dictated by addiction, imprisonment and poverty. Now, Patrick is starting his own business, volunteers at Ignite Hope, and recently helped an at-risk family get into a hotel for a few days. People can change. Augerlavoie and his family are proof. As a volunteer and resident, Sandra Avery understands how everyone can individually have a role in helping people. For a while, she looked after the children at Ignite Hope, picking up and coddling crying babies in the middle of the night. She said one man always brought laughter; another the gift of music. One time, she said a man wrote a letter with the most beautiful penmanship she’d ever seen. 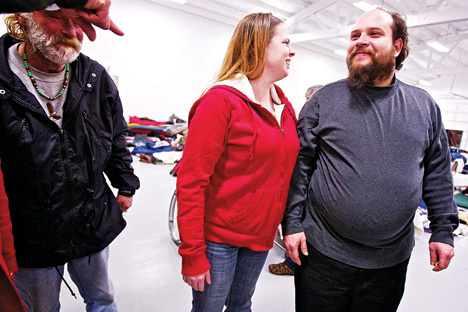 To volunteer at Ignite Hope, call Director of Volunteer Services Natalie Forsyth at 660-4675. 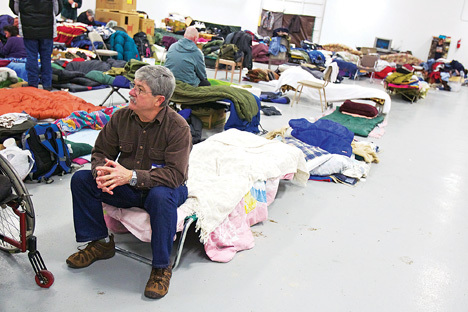 To donate food, clothing or sleeping bags, call outreach worker James Otten at 208-625-1000. Ignite Hope is located at 601 E. Seltice Way in Post Falls.